I haven't played anything on my DS in a long time (a few months, actually, since Sonny With a Chance and Disney Stitch Jam) so I thought it was time to get more use of the system than just set up my alarm every morning. 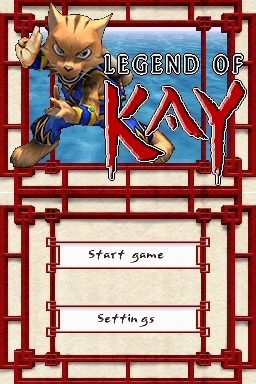 Some of you might remember Legend of Kay on the PS2, providing a good mix of combat and platform action. 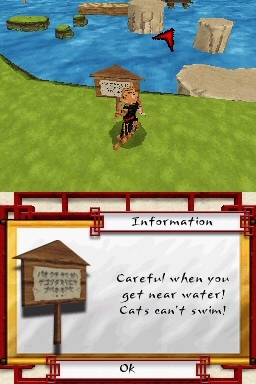 Your martial arts proficient feline is back, but if you're waiting to see a port of the original game for the Nintendo DS, think again. Animals have lived according to the teachings of the Way for many years, but slowly, cats, frogs, rabbits and pandas have forgotten the Way. 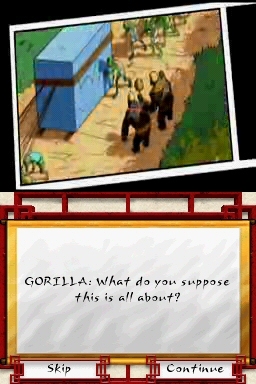 Now the island of Yenching is being overrun by gorillas and rats, and there is no one left able to fight back. 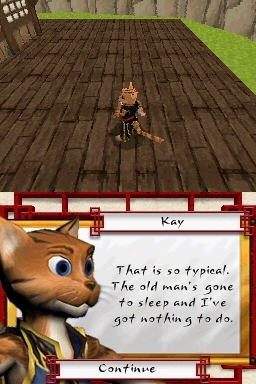 No one except for Kay, who has been raised in the Way by his martial arts master. 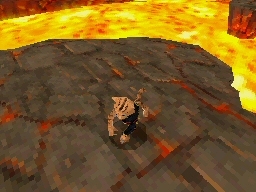 After an interesting initial comic book style intro presenting you with the story, you are left to control Kay. No need for a tutorial really, since all you need is one button to jump, one to sprint, one other t interact with things and finally another to take cover. It's certainly a control scheme accessible to everyone. 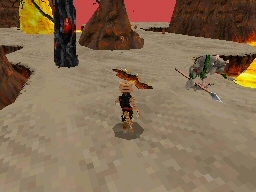 Unlike in the PS2 game, you don't have combat in this version. The reason behind it comes from the Way, which forbids animals to attack other sentient beings, that is, animals capable of feeling. 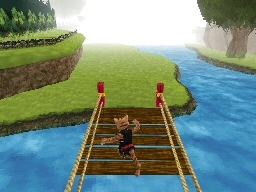 So you can hop on spiders heads Mario style, but you can't smack the snot out of the gorillas invading your peaceful island. However, shouldn't a spider be a sentient being as well? 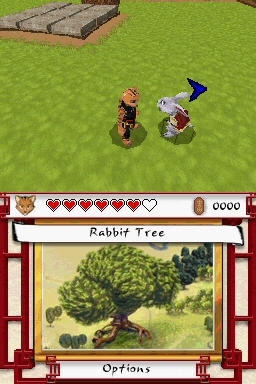 Basically, the gameplay takes place in 3D platform environments. 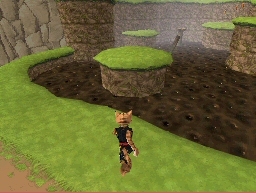 You run, you jump, you collect certain items, and you sneak past your enemies. 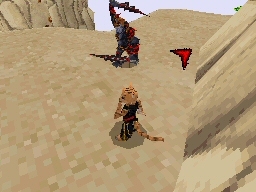 The stealth action isn't all that impressive, since you can just wait for enemies to turn around or look another way to go by. There isn't much of a challenge to the sneaking, which is ok, since it doesn't hinder the progression, but most times you need to find an alternative path to go around. What does hinder the progression is how bad the camera is. 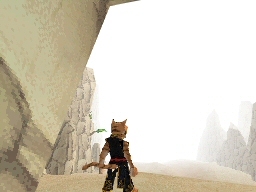 You can reset the camera view behind Kay so that it faces whatever direction he is facing, but you can't freely look around, which would have been extremely helpful in areas where you can't quite discern where to go next. I think part of the problem of my "now what?" 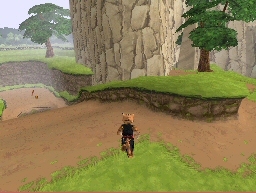 moments were the bland backgrounds and the directional arrow. 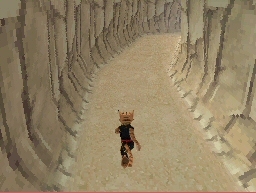 It's not that the stages are poorly designed, it's that the lack of elements and shading make it difficult to see if the next portion of terrain is at the same level or lower than you. 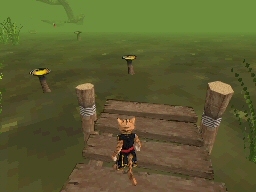 As for the directional arrow, it's supposed to guide you to the next area, but it fails miserably since the areas twist and turn a lot. 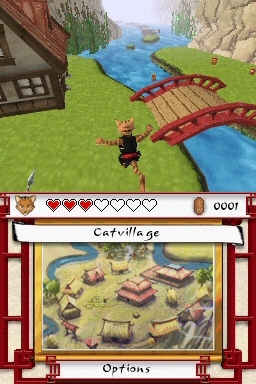 The map displayed on the touch screen is just an illustration of the current area, which is a pretty useless feature. Sure, the illustration looks nice, but it serves no purpose. I tried tapping it instinctively thinking it would show me a map of my surroundings, but no such luck. As a result, I wandered around lost many times back and forth through the same spaces trying to figure out where to go next. If the environments weren't so bare, you could use elements to guide yourself when backtracking. If I was confused by the tricky arrow, you can imagine the frustration of the young target audience. 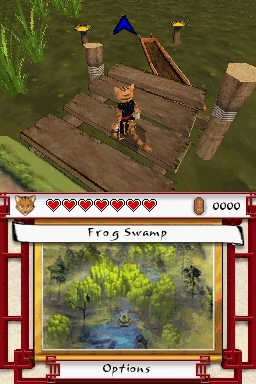 For the most straightforward parts, you have simple fetch quests, and the run and jump mechanic works well, making the game is actually enjoyable, and a Frogger-like stage in the swamp is sure to entertain you while it lasts. 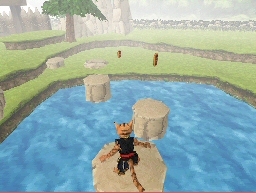 But overall, the difficulty of this game is higher than one would expect, with the camera angles in tight spots misleading the direction in which you want to jump, which results in a lot of backtracking, repetition and sometimes even dying. 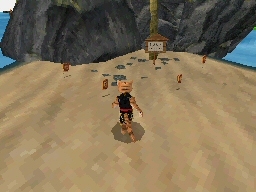 The checkpoints are few and far between, which rarely happens nowadays with portable titles, since most handheld games offer convenient save features or an abundance of save points throughout for the convenience of on-the-go gameplay. Not to continue on nitpicking, but I feel that the story and characters deserved more depth. The story is actually interesting, and it would have been nice to be able to interact with characters and learn more about the past and current events, or even just about themselves. 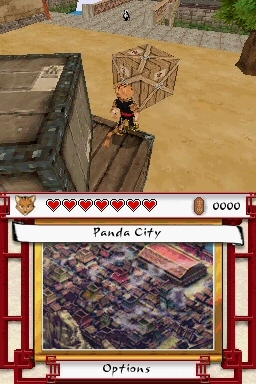 Nice illustrations, ease of gameplay and fairly large environments are just about the only positive things we can mention about Legend of Kay. 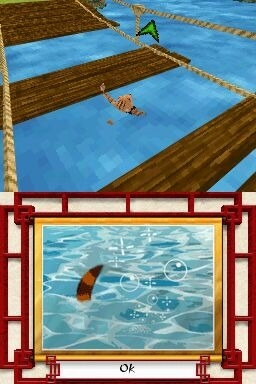 I'm left with the feeling that this game could be so much more, but unfortunately, it isn't. Special thanks to Michael Mota and Dreamcatcher Interactive for providing a copy of this title.